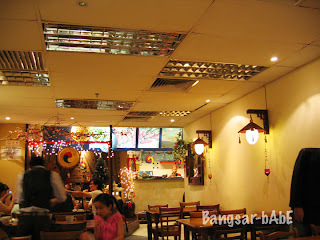 rif and I met up with Jeen for lunch on Christmas day at Haeun Khon, Amcorp Mall. I’ve been raving about this place to Jeen so I figured it was about time I took her there. 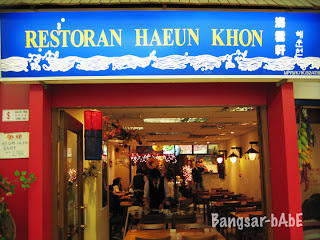 Haeun Khon serves good and reasonably priced Korean food. rif and I had the Sprite while Jeen ordered a hot green tea. 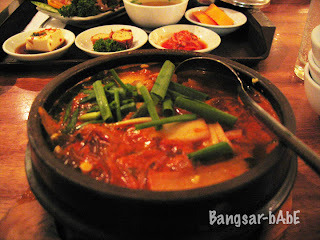 I always order their Kimchi Jjikeh (kimchi soup) whenever I dine here. Didn’t feel like having the set so I asked for the Kimchi Jjikeh alone. 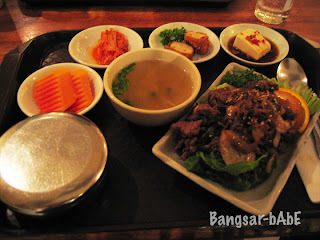 Their set version comes with rice and some side dishes (like the beef bulgogi set). My Kimchi Jjikeh was superb. Spicy, piping hot soup with beef slices, cabbage, glass noodles, chilies and carrots; it was an absolute delight. 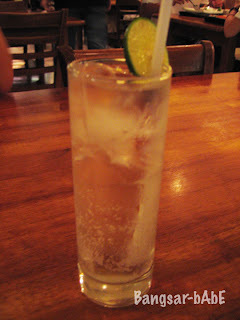 One sip was enough to send your tongue on a roller coaster of flavours; spicy, sweet and salty all at one go. It was THAT good. 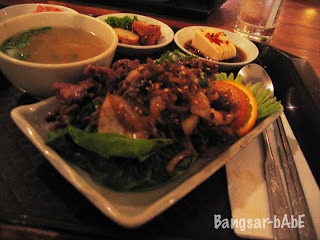 rif and Jeen both ordered the Bulgogi Jung Sik (beef bulgogi) set. The beef was delicious as always. Thin slices of tender beef, well marinated and stir-fried with onions and toasted sesame seeds. The set came with rice, clear soup, three side dishes and fruits. If you asked me, it was a pretty good deal. The outlet also serves Japanese and Chinese food but most patrons come here for their Korean dishes as this is after all, a Korean restaurant. Our lunch cost us RM 55.86 after 5% tax. Verdict: Delicious Korean food, delightful prices and cozy ambiance.